"Technology is my salvation... Through VisionKey I have access to the internet and all its resources. I do my banking and pay my bills online, send and receive e-mail and activate my speech synthesizer." VisionKey is the latest in eye controlled communication and enables users with severe physical disabilities to type and talk with their eyes. Lightweight and head mounted, VisionKey gives users communication independence and control in their lives by simply "looking". 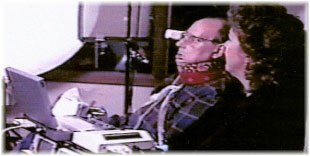 The system also gives them each a voice by enabling them to control a speech synthesizer in the VisionKey unit or on the computer. Now users can write letters, play games, surf the net and listen to multi-media sound just by moving their eyes. VisionKey combines a viewer mounted on a pair of standard frames with a small control unit. An eye tracker and a microcomputer measure the position of the eye and when a selection is made, it appears on the control unit LCD and on the computer. Users look at a specific word, letter or character on the chart in front of their eye and "type" by holding their gaze until a selection is confirmed by a green highlight and a beep. VisionKey 6.3V, 6.3H, scanning (vertical or horizontal) model for users with limited eye control.